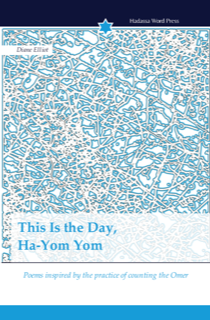 Rabbi Diane Elliot recently published This Is the Day, Ha-Yom Yom, Poems inspired by the practice of counting the Omer (Hadassa Word Press , 2017). Embodying the intersection of spiritual practice and creative process, these poems arose from simple day-by-day awareness, cultivated over the 49-day period between the festivals of Passover and Shavu’ot. In ancient times an omer or sheaf of barley was brought as an offering to the Jerusalem Temple just after the start of the Passover observance. The priest was to wave the sheaf and to count each of the 49 days between the Israelite pilgrimage festivals of Passover and Shavuot, ensuring the health of the summer wheat crop, which was gestating during those weeks. 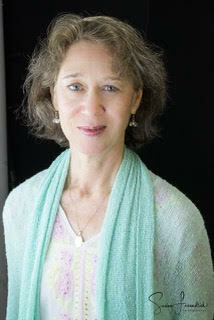 Retooled by the rabbinic sages as a historic exodus journey from freedom to revelation and by the 16th century kabbalists as a journey of personal spiritual refinement, a preparation for the receiving of revelation, this potent practice enjoins us to wake up, moment by moment, to the depth and value of our unique lives, to offer ourselves fully to the path of liberation through wisdom. These poems and the accompanying guide for practice are also an offering, an expression of one practitioner’s journey on that path and an invitation to deepen your own creative engagement with the Spirit that radiates through your life.